NSA Imperialist Spies Off Campus! Protest initiated by CUNY Internationalist Clubs against imperialist spy agency recruiting at Hunter College, March 4. ISO participated also. The following leaflet by the CUNY Internationalist Clubs was distributed at Hunter College on March 4. Intelligence historian James Bamford called it “the agency that could be Big Brother,” the sinister figure in George Orwell’s novel 1984 that was watching everyone. Only the NSA isn’t fiction, and YOU are the target. 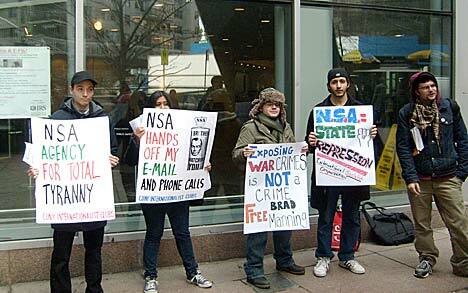 In 2005 the NSA was exposed for engaging in massive, illegal telephone surveillance ordered by George W. Bush. The next year, it was revealed that with the help of AT&T the super-secret spy agency was intercepting almost all international (and likely most domestic long-distance) phone calls. 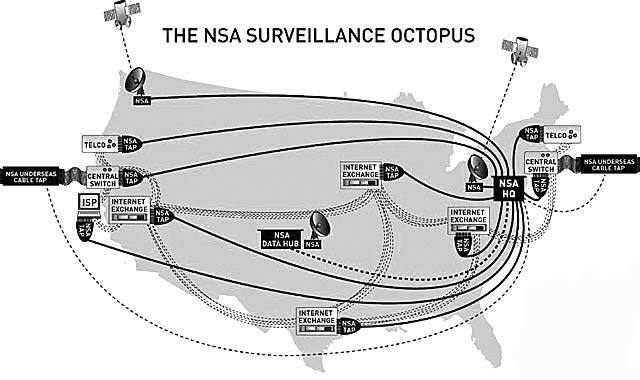 The NSA also scans and stores your e-mails, instant messages and every other form of electronic communication: some 1.7 billion messagesa day, as reported in the Washington Post’s 2010 investigation, “Top Secret America.” And this continues under President Barack Obama.